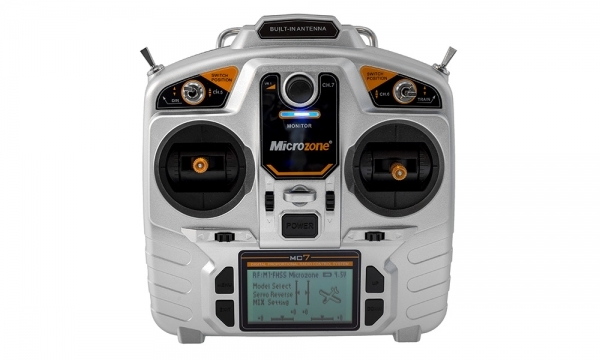 The MC-E7S is one awesome radio system with included ‘Stable Fly’ E7RE Gyro Stabilized Receiver System! Great for the beginner to the sport flyer to the advanced pilot! The E7RE receiver is a small powerful unit with a Gyro built in! This flight stabilization system is perfect for the novice pilot! The 3-position switch on the transmitter allows to switch between Manual Mode, Auto Mode and Sport Mode! In Manual Mode, the Gyro Stabilization is turned OFF. In Auto Mode (Amazing Mode) is the BEST mode for beginner pilots featuring ‘Auto Leveling’! The system will not allow the aircraft to roll or loop inverted and will automatically level out the aircraft when the transmitter sticks are released! Sports mode gives you all the benefits of Auto Leveling with the ability to perform aerobatics while the Gyro constantly monitors and corrects for a smooth flying experience! The MC-E7S is great for gliders, warbirds, and EDF Jets! Gyro Stabilization flight experience is the next level of RC and with the Microzone MC-E7S, fly with confidence!